Hello everyone, as I am back from hell. It has been quite a journey for me over these past 4 years as I've just completed my final semester in Architecture several days ago. Hence, me not updating for almost 1 month. Though the results are still pending, I may have extend 1 more semester due to some subject failure or some sort. So, hopefully not. Right, after the entire month of sleepless nights and movie-less life, The Hobbit was on top of my "must-watch-list-for-closure". The first Hobbit was shown during my first year degree and now the finale on my last. 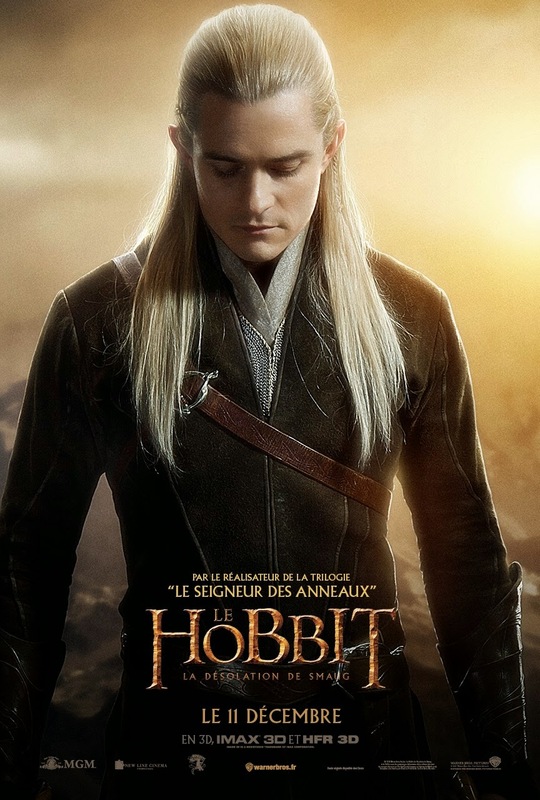 Thus the need to watch it (besides the fact that the Elven's hair are awesome). Many thanks to Tammy (if you're reading this), the founder of The Butterfly Project Malaysia, to be kind enough to share a pair of premiere passes on her wall, and with much luck, I was able to get it. The screening itself was held in TGV IMAX, Sunway Pyramid. Yes, IMAX. 10 hours of 3D-goodness of Tauriel and Legolas's hair. Unfortunately, Malaysia's premiering poster wasn't this. With those premiere screening passes, comes a set of Hobbit Tumbler and Popcorn each ticket as well. Colour changing tumbler! The look on her face when she saw the amount of people waiting outside along with the hype for The Hobbit. Hoho. Yes, it was crazy. But whats worst was the fact that we had to wait 1 hour + before they could actually play the damned movie. I guess everyone was seriously pissed. The screening was suppose to start at 5pm but was delayed till 6pm-ish+. Many were waiting (like the photo above, that was taken 20 minutes after 5pm). Even when the announcement was made stating they had some technical errors and do not know when the movie will be ready, many actually went and confront the person in charge with much rage on their face. After all, most of them paid RM60 for this. With all the waiting and what not, even our drinks included with the tumbler had ran dry. Popcorn half-eaten and was cold even before the movie start. Many were unhappy. We were just excited to be able to use the TGV Blanket-Pillow I got several months ago. So yeah.. But in the end, we gave up waiting and went for dinner. Came back and noticed that they started off with the second movie. Guess they had decided to cancel out the first one. I had no issues with that but I'm sure there were plenty who complained. First and foremost, the visual and audio quality were superb - as expected from IMAX itself. 3D was sufficient even when watching from an angle. Audio was crisp and clear, but wasn't as dynamic as the Atmos. A continuation of their previous movie, Smaug was covered in liquid gold when he flew to the nearest human village - Lake Town. Not forgetting to decimate it along the way. And like all movies, Brad, tries to be the hero by using a pair of bow and some arrows to kill a dragon - when they had clearly mentioned nothing could pierce the dragon's hide. Also, he had forgotten that his son helped hid the Black Arrow, the only arrow that could kill the dragon. At this point, the son remembered where he hid the Black Arrow, went and obtained it and passes it to his father. Unfortunately, Brad's bow broke and they had no way of firing the Black Arrow. Being an amazing father, he uses his son as a handle for the black arrow, leaning it on his shoulder while taking aim towards Smaug. Remarkably, even without Elven eyes, Brad accuracy was phenomenal. Firing the black arrow at approximately 300 meters away, through Smaug's body (the part where the hide was gone from the previous movie), and kill it instantly, although I'm pretty sure that's not where the heart is located. After all that ruckus, Brad was labeled the Dragon Slayer and was assigned "Town Chief" by the people of Lake Town. Fast forward, Thorin Oakenshield, son of Thrain (kereta api), was somewhat possessed by all the gold within Blue Mountain which I presume its just greed. Feeling insecure about all the gold he has, and the fact that Bilbo was "unable to find" the Arkenstone, he became paranoid. He forced everyone to search for it. With all that insecurities, paranoia, rage and anger, the humans (Brad) decided to show up and claim what Thorin had promised - a share of gold to rebuilt Lake Town. Now obviously that wouldn't be good, not even 1 bit. Since Thorin was infuriated by the missing Arkenstone and all his gold, he built a wall against the human, turning back on what he had promised. At this point, Thranduil, leader of the Elves, father of Legolas arrived to claim his shiny, silver stones (which I presume its actually Diamonds). Unwilling to return anything, Thorin has decided to go to war (obviously, the title says Battle of the 5 Armies). After all the arguing, debating, negotiating, and the disagreement of all 3 parties, comes the Orcs. Without a choice, everyone except the party of Thorin joined forces to fight against the Orcs. Thorin you uncultured swine - it was his idea to stay behind walls and protect the gold. Hence, they fought and fought, there was no stop. Until Thranduil saw the amount of corpse, laying dead on the floor. "Enough", he said, as plenty of Elves were killed by the Orcs. Withdrawing from the battle, as a means of saving his kin, and an uncultured swine he was. At this point of the movie, it was almost coming to an end. And at this point I shall stop. No more additional spoilers. However, the movie itself was pretty predictable - since LOTR its their sequel, its quite obvious who will die and who will survive. Anyway, thanks for reading this long and non-food related post. Food reviews are currently on the way! Thank you and have a nice day.